The Textile Bowl is always interesting and heated – and this year is no different. 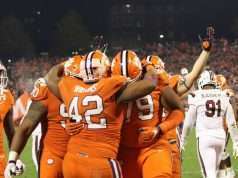 For a non-primary rivalry, both fan bases and teams share an intense passion for the game that is shown throughout a variety of events throughout the years: the Isaiah Battle punch, the knockout Wayne Gallman hit, and last year’s infamous laptop remarks. Although this is the last matchup of two undefeated Power Five teams, the overlooked part of this game is that NC State has not faced a true test in 2018. They struggled with FCS powerhouse James Madison before taking care of Georgia State easily. Through no fault of their own, their game with championship contender West Virginia was cancelled due to Hurricane Florence. The Wolfpack then struggled in wins over Marshall, Virginia, and Boston College (who was without game changing talent AJ Dillon). NC State’s entire defensive line was drafted last year, including Bradley Chubb who went to the Denver Broncos with the fifth overall pick. Coach Swinney mentioned that the Wolfpack winning the line of scrimmage last year was key in their almost-upset, but an improved Clemson offensive line and a newer NC State defensive line gives Clemson an edge. Ryan Finley is a very good college quarterback who will play in the NFL, but he is not a first-round draft pick type player in the way that some would consider Kellen Mond or that the Tigers have seen with players like Lamar Jackson, Baker Mayfield, or Jameis Winston. 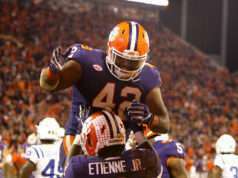 He is the classic decade-long NFL backup quarterback, but that doesn’t mean that Clemson can take him lightly. 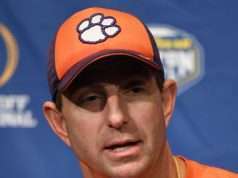 He will exploit any mistakes made by Clemson’s defense and has complete command of their system, so the secondary must continue improving and not play like they did against Texas A&M. While Finely may not be a first round draft pick, and while all-purpose-back Jaylen Samuels and running back Nyheim Hines are in the NFL, NC State has a legitimate first round draft pick in wide receiver Kelvin Harmon. Harmon is smart like Hunter Renfrow, and an extremely strong player who is NC State’s clutch playmaker. 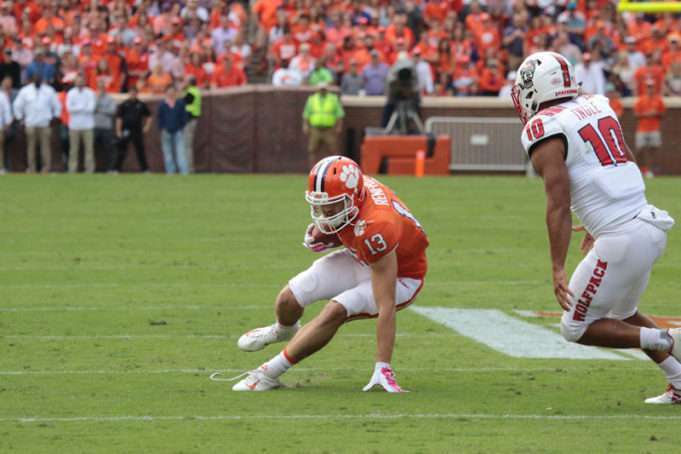 The Wolfpack are not just limited to Kelvin Harmon, as Jakobi Meyers and other players can legitimately compete with Clemson for the title of best wide receiver group in the ACC – head and shoulders above the rest of the teams. Their best offensive lineman is Garrett Bradbury who should be drafted next year. The over under is 57.5 and the Tigers are favored by 17.5 points. NC State has not played tough competition yet, so it is tough to gauge how they will fare against Clemson. The game will be interesting, but there is a legitimate reason that College Game Day went to Pullman, WA for Oregon vs Washington State.